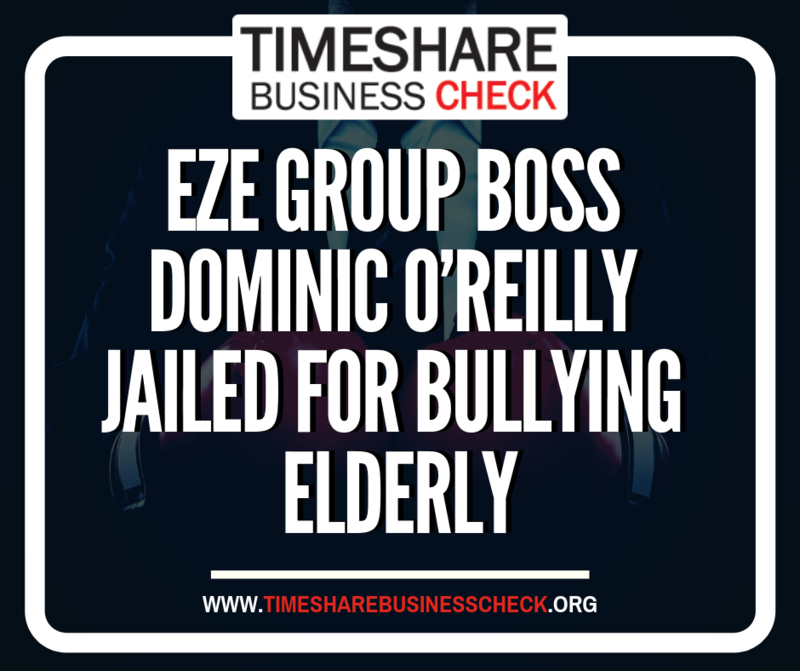 ‘O’Reilly headed up Eze Europe Ltd and fleeced elderly into handing over cash. An intimidating company owner who “bullied and frightened” victims into shelling out more than £200,000 in a timeshare scam has been jailed. If you have been affected by EZE Group, then you can contact KwikChex via the Task Force website – https://timesharebusinesscheck.org/free-assistance/. Assistance is entirely free and the service is Trading Standards vetted and approved. On Friday, 17th November, EZE Europe Ltd., Dominic O’Reilly (described as the CEO of EZE Group) and his daughter Stephanie O’Reilly, a director of EZE Europe Ltd., appeared at Birmingham Magistrates’ Court. All pleaded guilty to offences under the Consumer Protection from Unfair Trading Regulations 2008. These related to misrepresentations regarding the selling of ‘Leisure Credits’ or ‘Concierge Services’ a ‘holiday and lifestyle’ product and connected purported legal assistance to timeshare owners. Leisure Credits have been the subject of official warnings by the UK authorities. Because of the scale of the offences, the case has been sent to Birmingham Crown Court for sentencing, with an initial appearance on 15th December. The sentence available to the court is up to 2 years imprisonment per offence and/or other sentences. EZE Group have a high profile, having been a long time sponsor and commercial partner of Birmingham City FC, with one of the stands at the St. Andrew’s ground currently named the ‘EZE Group Stand’. They are also an ‘Official Club Partner’ of Celtic FC. The actions by Trading Standards result from a substantial number of complaints by consumers. At the request of Trading Standards, KwikChex have also provided information regarding EZE based on information obtained from consumers that have made contact via the Timeshare Task Force. EZE Group were previously successful in a libel action brought against a Spanish based consumer alert organisation – ‘Mindtimeshare’ and its owner, Alberto Garcia, who had published allegations of wrongdoing by EZE. The ruling was in fact on a default basis as the defendants did not file a defence in time. The allegations made reflected the offences which they have now pleaded guilty to. EZE have a history of issuing threats and commencing defamation actions against those that have published information suggesting they have breached Consumer Protection Regulations, using law firm Pinder Reaux. Businesses closely connected with EZE, LCM Law and Praetorian Legal have also made such threats. LCM Law has as a director Gary Smith – previously described as ‘Legal & Compliance Director of EZE Group’. Gary Smith is also a director of Praetorian Legal – and Dominic O’Reilly, who is now set to stand trial on numerous charges was also a director of Praetorian Legal. Aside from the default judgement in the Mindtimeshare case, all other such threats that KwikChex is aware of have all been successfully defeated at the outset. Caution recommended regarding claims against EZE. We also note that some businesses are soliciting EZE clients with regard to making claims against EZE. Prior to any payment of fees for such actions, we would advise that clients of EZE exercise caution and diligence. If payment was made to EZE by credit card, then there is the possibility of filing a claim under Section 75 of the Consumer Credit Act, which provides protection to consumers who may have been victims of misrepresentation or where there may be a breach of contract. But such applications can be made free of charge – and free advice is available via, for example, Citizens Advice. KwikChex has also already provided free assistance to consumers, which has resulted in successful claims against EZE. For those consumers that have paid by other means, such as a debit card or bank transfer, the current situation needs to be clarified with regard to the likelihood of success of any civil claim. We recommend consultation and risk assessment before paying any fees. This should include the possibility of the legal entities involved, such as EZE Europe Ltd., not being able to carry on as a viable business. This company has recently filed accounts which show it has a large trading loss. The size and number of claims that might be filed and what assets might be available to claim against are not known. In addition, proceedings under the Proceeds of Crime Act are highly likely, which would almost certainly result in the freezing of all assets, followed by potential seizure.